Home > Mutual Funds - Equity > India: Investors in Mutual Funds Moving from Equity to Debt..! 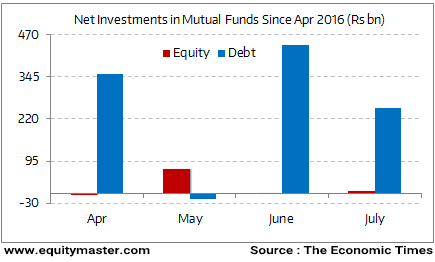 India: Investors in Mutual Funds Moving from Equity to Debt..! Close to a whopping Rs.7,000 Cr have been poured into debt mutual funds by investors since June 1, 2016. In comparison, equities have attracted investments worth a paltry Rs .400 Cr during the same period. In fact, even the couple of months prior to that, debt mutual funds have garnered significantly higher inflows than their equities counterpart. The reason? Well, the old habit of looking into the rear view mirror and not the windshield. Experts contend that since debt mutual funds have given better returns than equity mutual funds over the last one year or so, investors are optimistic that the trend will continue. They further argue that as stocks markets are looking expensive and as there are hope of rate cuts on the anvil, there's even more reason to tilt towards debt. Well, according to equitymaster.com, it is not the returns of the past but the valuations that count. Stocks have run up alright but they are nowhere close to being very expensive. In fact, at the current valuations, the SENSEX is trading at a small premium to its long term average, which in equitymaster.com view cannot be termed as very expensive. Besides, when you consider that corporate profit margins are at multi-year lows and could rebound over the medium term, then the case for equities becomes even stronger. The current markets call for at least a 50% to 60% tilt towards equities and the rest towards debt if not more. Life insurance: Premium payment options..! Five Chennai Localities To Buy A Dream Flat In..! Documents for NRI HOUSING LOAN..! Personal Details Required for availing Home Loan.